This spring we welcomed a group of French students to our flagship 504K development in Plymouth as part of our commitment to help inspire the next generation about the career opportunities within the construction industry. 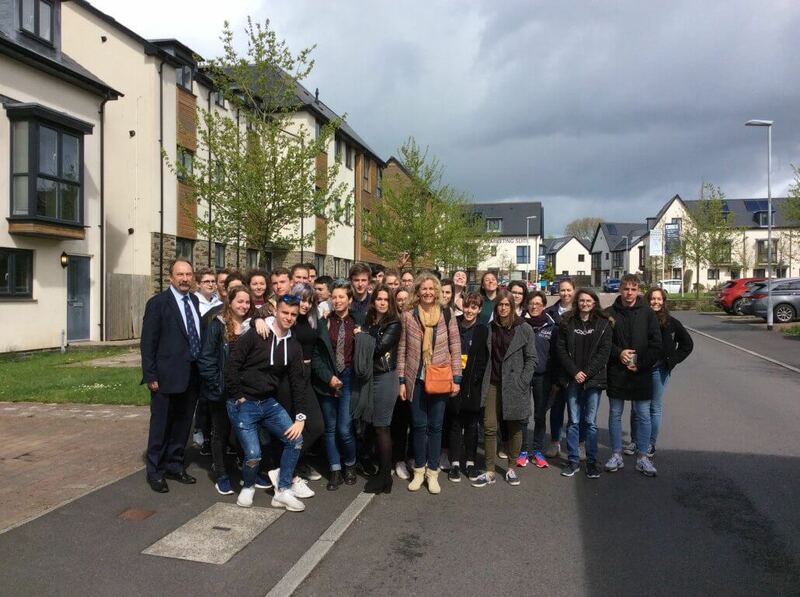 The group of 34 students aged 16 – 19, were visiting from Brittany on a four-day English language and business studies trip to South Devon during which they stayed at the homes of Plymouth families. 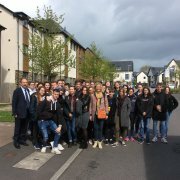 The teenagers from Lycée Amiral Ronarc’h in Brest, were given a tour of the development by our company director Martin Cavanna who told them about the evolution of our three-generation family business over 95 years, explained the rules and regulations of the British construction industry and discussed its wide-ranging career prospects. We’re keen to raise the profile of the construction industry and raise awareness about the range of career opportunities it offers among young people, so we were more than happy to contribute to the French students’ trip if we could. We want to spread the message that the construction industry doesn’t just involve brick layers, architects and engineers, but that it’s a very broad church offering a whole raft of different roles from marketing and advertising to quantity surveying and sales. It’s an industry that will suit people looking to work in the outdoors but also those who prefer office-based roles, as well as being a well-paid profession with the potential to earn up to three times that of other sectors, such as hospitality and retail. Located off Plymbridge Lane close to Derriford hospital, 504K is a large development of 275 homes and is due for completion later this year, so it was an ideal location to provide the visiting students with an insight into our work and the wider industry. The English and French home building industries have quite a lot of differences in terms of their construction and their exterior and interior finishes, so the students’ visit to 504K will have given them an insight into how we do things in the UK. This year’s visit on April 30th came off the back of a similar successful visit in 2016 when a group from the school visited our Boatyard development in Plymouth. This year the students’ visit also saw them following in Agatha Christie’s footsteps in Torquay, walking on Dartmoor and visiting Totnes to learn about the town’s sustainability initiative, Transition Town Totnes.